How do you remove V9 Portal? Also how do you Close All Google Chrome Programs? I do apologize for the delay. No one is intentionally overlooked. V9 Portal is a browser hijacker that is usually installed as foistware when you download other software. Anytime you install software, you have to pay close attention to each screen as the install progresses so you can un-check this type of software. See if the following 2 programs removes V9 Portal. If not, we may have to move you to the spyware removal forum and perform more indepth scans to remove it. 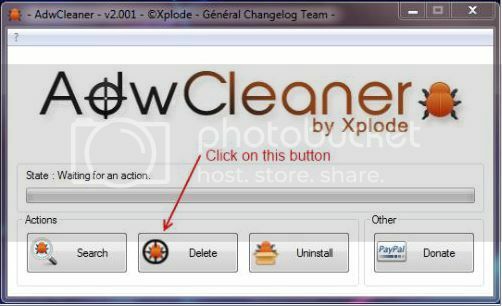 Click Delete button as shown below. Save any open files and approve the reboot. A text file will open after the restart. Run the tool by double-clicking on XP. Or right click and select Run as Administrator Vista/Win7 and above. Please let me know if you have success.